(Family Features)--Cats take on so many different roles within their owners' lives and families, such as cuddle buddies, emotional support animals, quiet companions and purring playmates. Each furry feline deserves the best, so as a cat owner, it's important to shower your pet with love and make him feel special all year round. 1. Give Them Their Own Space - They may be small, but cats need their own space to exert energy during the day. Provide them with an area to call their own to play with and store their toys. If you live in an apartment or a smaller home, vertical space works great for cats. For example, giving your furry pal a cat tree to climb on shows you understand his needs. 2. Know Nutrition - It's important to understand the ingredients you are feeding your feline and the effects they may have on his body. When in doubt, look for food and treats made with real meat to provide protein cats need. 3. Incorporate Hygiene into Your Routine - Treating your cat to a nightly routine of brushing is a great way to show some love while maintaining hygiene. Keeping your cat's coat healthy and shiny can also make him an even fluffier cuddle buddy, so you can both benefit from the bonding experience of a nightly brush and cuddle session. 4. 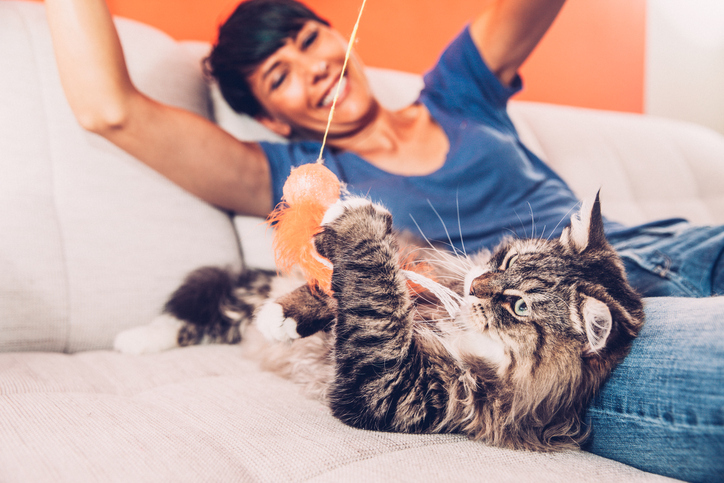 Make Playtime a Priority - Cats have a natural curiosity and love to get their paws on things. Make sure you're giving your cat lots of love by exploring what kind of toys will give them the best experience. 5. Stay Proactive with Health - An easy way to show love for your cat is to schedule annual visits to the vet. Don't just wait for signs of illness; be proactive and keep your furry friend up-to-date on all shots and checkups to help ensure a happy and healthy life together.